...and Baby Makes Six... | The blog of a wife and mother, featuring recipes, stories, crafts, and reviews. The blog of a wife and mother, featuring recipes, stories, crafts, and reviews. A Letter to my Children about Love. This is the product of a discussion I had with my two daughters. Share if you must but please give proper credit. This…is my heart here. A baby and her newb mother. It broke my heart when you told me. Not because of what you were saying. But you were nervous. Tense. I could see it in your eyes, it rolled off of you in waves. You’d labeled yourself and were nervous about telling me. And it broke me. I would rejoice with you. Love is love. You never need to label yourself as anything with me, your only label is my daughter. My son. Who I love, each and every one of you, just the way you are on any given day. Labels put you in a box and by God, my child, you…you are better than a box. Love is love. In a world where so few people find real, deep, true love…love is too precious and sacred to be put into a box and held by a solitary definition. It is beautiful, wonderful. And when you find it, hold on to it. Cherish it. Water the sprout and watch it blossom. I don’t care who you find it with. So long as they’re good people and treat you right, that’s all that matters to me. I have heard some of your peers. Scared to speak their truths to their parents about who they love. As a mother, I find that incredibly heart-shattering. Nothing will ever change that you are my children and I love you. Unconditionally. No strings. Even when I don’t agree with the way you act, speak, dress, etc. Nothing lessens the love I have for each of you. Just the way you are. Love is love. So if you think a girl is cute and you want to get to know her…go for it. If you think a boy is cute and you want to get to know him…go for it. I will never love you less for who you love. I carried you each within me, my heartbeat was your metronome for 41, 38, 40, and 42 weeks. I brought you into this world, some more painfully than the others. Some of you were easy on my body. Some of you, I struggled for. Your heartbeats were my compass. Your souls are the stars in my skies. Bright, beautiful, and awe-inspiring. How very, very proud I am to be your mother. Even when I need time away from you. Nothing lessens the love. Do not label yourselves, my children. You are more than a label. More than a box. More than one definitive term. You are love embodied for each of you were made in love, brought into the world in love, and raised in unconditional love and support. Don’t clip your wings before you learn to fly. Love is love and my love for you is eternal. Unconditional. Never-ending. Yes, I’m aware that’s a band. But when thinking about a title for this post, I kept coming back to those three words. All that remains. This is a painful thing to write. It isn’t something you’d normally say about something good. So, the Mister and I have been together for a long time. So long that both of us, for various reasons, lost sight of/stopped doing all the things that we used to. Kids can change a relationship, and now we’ve got four. And they’re great. But along the way, we lost things. So I haven’t been writing as much as I was hoping to, the holidays were busy, and I have been dealing with all the lovely pregnancy things. As most of you probably know, this is a rainbow baby for me. I found out I was pregnant exactly five months to the day after I found out I was pregnant…a pregnancy that would end in miscarriage. My last post was very difficult to write, and shared a very, very hurtful thing that I am still finding myself coping with. My last post was in October of 2014. In that time, a world of changes have occurred. We moved to a bigger home. The kids adjusted to school. BabyBoy is now a preschooler, and has made so much progress. Life has been good, and it left me in a better place to deal with the blow I am coping with now. Our eldest had asked for either a kitten, a puppy, or a baby for her birthday this year, and the Mister and I delivered an emphatic “NO!” to all three. Joke was on us, we found out the day after her birthday that I was pregnant with our fourth child. We were terrified, but after a couple of hours, we began to talk about it, and we grew excited. I was looking forward to this being a happy, healthy pregnancy. I bought prenatal vitamins. Iron. Was eating well and only having periodic nausea. I will not go into all the numbers, the findings…the rollercoaster, as I have come to call it. But on April 29th, after a promising rally, came the drop that broke my heart. I miscarried my baby at 7 weeks and a couple days. The rainbow I had seen after dinner the night before had not been a sign of hope…it was a goodbye. And since then, the ride has not stopped. With other losses…I didn’t know the joy of motherhood (and the frustration), I didn’t see anything on a screen. This has hit me hard and left me desperately treading water in a wide open sea. People said “At least you were early”, and “Be thankful for the children you have”. I want to punch everyone who says that to me in the face. If you’ve said it to me, I’ve wanted to punch you. Please don’t take it personal. I understand you don’t know what to say. Hell, I don’t know what to say. I need to be honest, and please know that I’m not saying anything against anyone. Everyone has been so wonderful, caring and supportive. I need to make that clear. And yet despite all of that, I don’t think I’ve ever felt more alone in my life. I know I did nothing wrong, and yet guilt kills me. I had drank wine the night before I found out I was pregnant. I had this wonderful little life in me, I got to see that on the screen…and I couldn’t protect him. I couldn’t nurture him, and all the love in the world couldn’t save him, keep him with me. My sheer force of will was not enough, and I feel like I have utterly failed my child. I have my good days. Mother’s Day was a good day. The sun finally came out. I named him. I had a name to attach to my agony. Dominic Charles. I wrote him letters, I cried so many tears that I ran out of them and sat there sobbing without my cheeks getting wet. He wasn’t planned, but I wanted him, loved him with all my heart the moment I saw those two lines. To see the fetal pole (the baby, for those not familiar with the term), and no heartbeat…please beat. Please flicker. I begged in my head, prayed with all my heart. Nobody warned me about the aftermath. My previous miscarriage was different. Everything was taken from my body. This one, I opted to let my body take over. Nobody told me that the thought of flushing the toilet would cripple me with guilt, nobody prepared me to deal with the sight of baby clothes, newborns, diaper commercials. Going past the hospital makes my throat ache from the lump that forms. No one prepared me for the anger I feel at knowing that I should have been holding a beautiful new baby in my arms this Christmas, knowing the joys and pains of motherhood, and looking forward to having another join the ride of life…and having it all taken away. I feel robbed. I feel cheated. I loved him so much, why wasn’t that enough? But if love could keep all our babies here, there’d be no grieving mothers. No. I’m not dealing. I have days where I am okay. And I have days like today where opening a packet of information and resources for perinatal loss brought the pain back as harsh and as hard as it was the day I knew it was all over. A part of me is still struggling. Maybe to some it was as simple as “Merry was pregnant and now she isn’t anymore”. To me, to my heart, it isn’t that simple. It will never be that simple. I had two lines. I watched my baby start to form. The sac, the fetal pole…I watched it all happen, and I am so angry, heartbroken, and sad because I couldn’t save him. Don’t tell me I can have another. Don’t tell me he was ‘defective’ or ‘chromosomal defects are the leading cause of miscarriage’ or ‘maybe it didn’t plant right in the womb’. I know all of this and none of it matters to me, none of it comforts me or helps me justify things, because no matter what, he was my child, and I’ve lost him. You don’t have to know what to say. Trust me, nothing will ease the pain. Just ask me what I need. A hug. 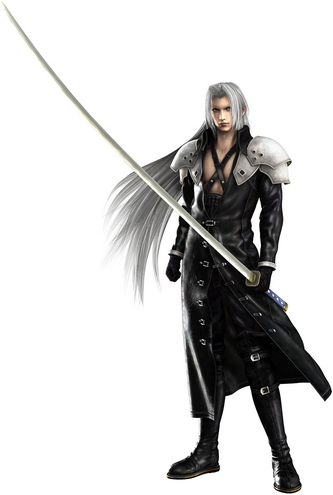 Hi, I’m Sephiroth. I have a big sword and even bigger mommy issues. Um, Merry? You’re a mommy blogger, yeah? So what’s up with this post? While most of my blogs have focused on life as a mom, I also have hobbies, and among them is a love of the Final Fantasy series. Final Fantasy 7 was the first one I played, and since then, I have played nearly every title in the series, and loved most of them. And Baby Makes Six on Facebook! A daughter of Christ taking college day by day and learning as she goes.